It took me about two weeks to write this short poem a few summers ago after having visited my son Nathanael when he was living in California at the time as uchideshi, a live-in student under his teacher, Pat Hendricks Sensei at Aikido of San Leandro. He grew a lot from that experience, not only as a martial artist, but also as a young man and a teacher. His Sensei allowed me to stay with him in the dojo and I got to see her teach this Japanese martial art. It was impressive. She was impressive. I tried to capture what I had witnessed in a tanka, a Japanese form of poetry. I sent it to Nathanael to read to her on her birthday. It had a powerful effect on her at the time, for personal reasons. It surprised me. But I was also pleased that it had touched her. It was my gift to her in words, thanking her for her hospitality, and the transformation she was bringing to her students, especially my son. ADDENDUM: On September 30, 2010, 43 years to the day I started TM in Montreal, Nathanael was back visiting the San Leandro Dojo for his friend and former student’s blackbelt test. Nathanael had traded private lessons for website design. When he went to use the office computer, there on the screensaver, was my poem! He sent it to me. How beautifully put together! Turns out it was done by one of the uchideshi around the time I had resent the poem and this post to Pat Sensei. She finally saw it and acknowledged her appreciation for the poem and our friendship, which moved me. So wonderful to see this! Click on the image to enlarge it. 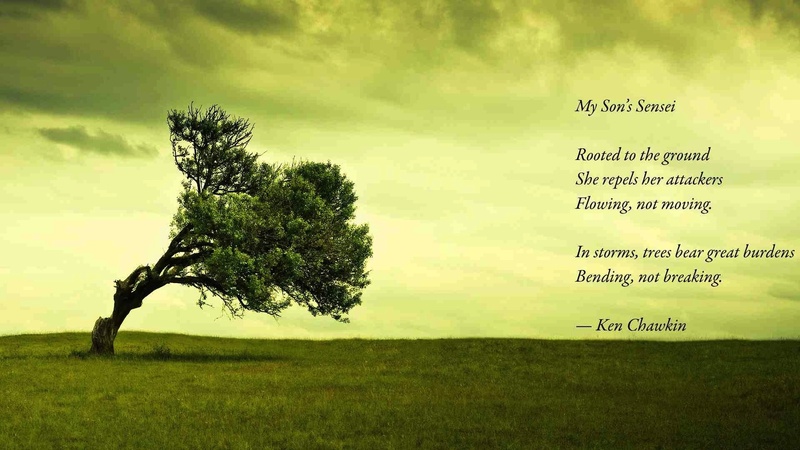 See INSPIRATION, a poem by Nathanael Chawkin and Willow Tree – a tanka – from a tree’s perspective. This entry was posted on April 21, 2010 at 1:24 am and is filed under Education, Literature, My poems, Peace, Poetry, Writing. You can follow any responses to this entry through the RSS 2.0 feed. You can leave a response, or trackback from your own site. I have trained in different Martial arts now for well above 15 years. and they soon start to understand. rid of their aggression without hurting or bullying anyone.